At Warner Design Associates, we love using our 25+ years of experience in the senior living interior design industry to tackle any challenges for our clients. 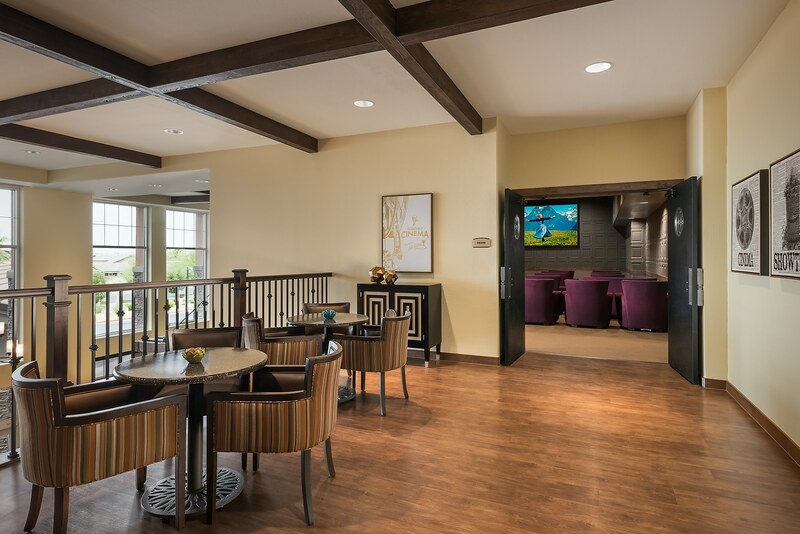 In fact, we recently worked with one new construction, assisted living community in Arizona to find solutions for three interior design challenges that ended with a great result. See how we approached and solved each interior design challenge! The original plans for this assisted living community featured a theater space with a concessions stand / café outside the theater. It would serve as a place for residents to get a cup of coffee while reading their paper or people-watching during the day. It would also be a place for residents to get their popcorn or candy before heading in to watch a movie. During construction, it became necessary to increase the size of the theater to accommodate more people in a flex space while also cutting back on the costs of building the concessions stand / café. This “value engineering” focuses on maximizing a projects function while minimizing cost, to generate the greatest value for clients. Our challenge was to maintain the original vision function with these new changes. theater where residents can still get their popcorn and beverages. The outside of the theater features a comfortable lobby area, still allowing a place for residents and guests to gather to read their paper or watch people coming and going from the building. A win-win! The client desired a dining space that offered flexibility and different dining options for residents. However, the original layout of the dining room was small, and could not be moved as it needed to be located adjacent to the existing kitchen (which was already servicing the pre-existing Memory Care building.) The original layout also had other amenity spaces, such as a multi-purpose room, near or adjacent to the dining room. The multi-purpose room was relocated and a bistro / casual dining space was added to the dining area, providing the increased dining options the client and residents value. With the new location of the multi-purpose room this also offers additional dining space if necessary for large functions or events. With a family-driven mission to the community, a third goal was to focus on creating a community that appeals to residents and family members of all generations alike, with a large variety of beneficial and unique amenities. communities. One example is “Noah’s Place” where visiting family members of all ages can play board or Wii video games, draw on the giant chalkboard wall, watch TV, do homework on their laptops, and more. The use of colorful carpet tiles throughout the area adds the extra pop of color and energy to the space that is unexpected in a senior living community. Have design challenges you need help solving? Visit our portfolio and contact us to learn more about how we can help you create the best in senior living.